Archimandrite Irenei examines a sermon by St. Leo of Rome, normally read in the season of Pascha, yet which sheds great light on the coming of the Lord, and the pastoral message to be gleaned from the intense theological disputes about Christ’s natures that raged in the early Church. 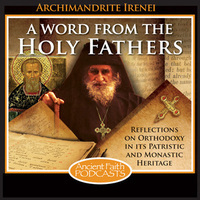 Recorded during a forest walk, this week's broadcast considers a traditional saying regarding St. Athanasius' encounter with three monks on an island, and the relationship between doctrine and transfiguration. As Orthodox Christians, we are neither pantheists nor theists, but rather panentheists. Fr. Richard explains.